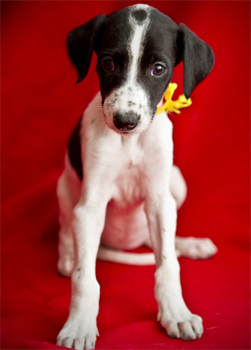 Lexi is a 12-week-old white & black female born approximately June 8, 2011. 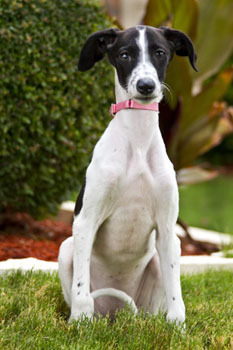 She was seized from a Fort Worth home along with her mother Faith and 7 other puppies on July 6, 2011. The eight puppies varied in weight from 3.5 to 4.9 pounds and now weigh between 13 and 16 pounds! 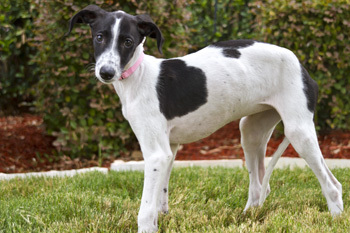 Rachel was covered in ticks and fleas, which were thankfully mostly dead by the time GALT received her from FWACC. She has been treated for intestinal parasites and respiratory infection, and is not showing any signs of long-term ill-effects from her intial neglect. Lexi is ready to cuddle with a new family! 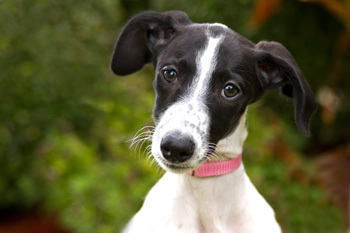 Lexi was named by Gayle & Richard Clarkson: We have chosen Lexi for the little darling. Lexi is short for Alexandra, which is for the defender of mankind (mythology). Thanks, it was so much fun.